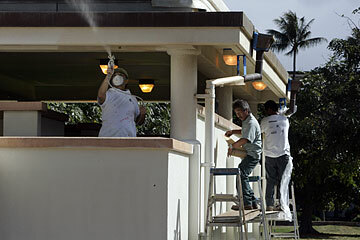 Painters worked yesterday to spruce up restroom facilities in the middle of Ala Moana Park. One of Honolulu's busiest and most beloved parks was a sea of tranquility yesterday, except for the 100 workers who were busy restoring some of its past glory. The unprecedented three-day closure of Ala Moana Park -- often described as one of the jewels of the city's park system -- already appeared to be paying some dividends. After workers spent hours sprucing up the place, it was looking much cleaner. The cleanup has not come without controversy. Mayor Mufi Hannemann closed the park at night, forcing more than 200 homeless people who had been camping there to seek refuge at other places. What will happen to them is still being decided by state and city officials and faith-based organizations helping them. If the homeless issue has divided public opinion, it was easy to agree on at least one thing: Ala Moana desperately needed a face lift. And yesterday, park users and concession stand owners liked what they saw. "I think they're doing a great job," said Moses Schultz, co-owner of Concession Surf-n-Snack, near the entrance to the Magic Island parking lot. "It was long overdue." The three-day cleanup has been described as the largest ever undertaken at the 120-acre park. It started yesterday, with 100 crew members who trimmed hedges and coconut palm trees; repainted picnic tables, traffic lanes and crosswalks; picked up trash; replenished sand along the beach; repaired lifeguard towers and attended to other matters. All of that work translated to one-third of the total cleanup by day's end, said Toni Robinson, assistant administrator for Park Maintenance and Recreation Services. "I think it looks a lot better," said beach-goer Sheena Burch, who was sitting near an open-air corridor at the park with her 8-month-old son, Dominick. Burch said she would see litter and debris build up along the curbside of the road that runs through the park. But yesterday, it was clean, she said. Except for the tree trimming, all of the work is being done by city workers. Using cherry pickers, city contractors trimmed coconut palm trees near the Magic Island parking lot. Other workers placed mulch around the base of banyan trees to maintain moisture. The bathrooms, often a focus of complaints, also will get some attention, and workers expect to fix the sprinkler system. If time permits, the concrete wall that borders the beach will be painted, Robinson said. And after all that cleaning, Parks Director Les Chang plans to ask Hannemann to make night closures permanent. City officials say they want to deter illegal activity. The night closures started in late March and will continue until the end of June. Chang said he has received positive feedback from the public about the night closures, and he's supported by the park board. "We feel that Ala Moana is one of our crowned jewels. We want to bring the shine back to it," he said.